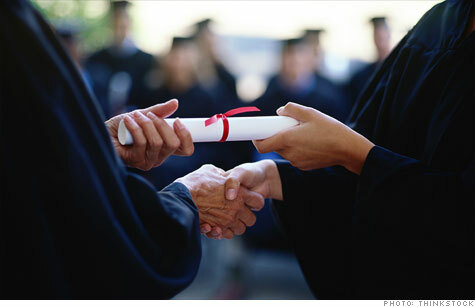 The college graduation gap between rich and poor is widening. NEW YORK (CNNMoney) -- It's getting more difficult for low-income students to climb the economic ladder as the college graduation gap between the rich and poor grows. While more students from all backgrounds are finishing college, the difference in graduation rates between the top and bottom income groups has widened by nearly 50% over two decades. And since education is a key driver of upward mobility, this gulf means that it's even harder for the poor to prosper. Some 54% of students from wealthy families obtained bachelor's degrees, said Martha Bailey, an assistant economics professor at the University of Michigan. But only 9% of low-income students got college diplomas. Bailey recently co-authored a paper looking at students who graduated in the late 1990s and early 2000s and compared them to those in college two decades before. She found the wealthy made great gains in graduation rates, while the poor only inched up over that time period. In the earlier group, 36% of the upper-income children graduated college and 5% of the poor did. Part of the reason is because more students from households earning at least $87,000 annually are going onto higher education. But children from families making less than $26,000 have not made the same advances, said Bailey. And while two-thirds of freshmen from wealthier households finish, only one-third of their poorer classmates do. Other researchers, whose work has found similar discrepancies, have looked into why children from low-income backgrounds don't make it through college. One reason is the poor often go to lower-tier schools, said Tim Smeeding, the director for the Institute for Research on Poverty at the University of Wisconsin-Madison. These institutions often have bigger classes and offer less individual attention and guidance. Also, their parents don't have the financial means to aid their children. "We've got a problem in that we get low-income kids to college, but they don't persist to graduation," Smeeding said. "It's harder for them to find their way through. They get discouraged and they drop out." Failing to get a college degree makes it even harder for these individuals to escape the bottom of the income barrel. Some 41% of students who come from families in the lowest income ranks move up to the highest two rungs if they get a college degree, according to research from the Pew Economic Mobility Project. But if they don't, only 14% advance that far. At the same time, 45% of those without a diploma stay stuck in the lowest tier, while only 16% of their counterparts with a college degree do. That's because so many better-paying jobs today require more education and skills that workers can only get in college. Without a bachelor's degree, many people get stuck in dead-end jobs earning low wages. In fact, a college graduate working full-time for 40 years will earn $1 million more than someone with just a high school degree, according to recent Census Bureau data. This is why it's increasingly important for policy makers to promote and protect programs that help students, particularly those from the lower income rungs, to attend and complete college, experts said. This includes expanding tuition assistance for poorer children to give them a better shot at future financial security. "The chance for upward mobility from the bottom without a college degree is extremely limited," said Erin Currier, project manager at Pew. "There is a significant wage premium for having a college degree." Are you between 18 and 34 years old? Do you still believe you personally can achieve the American Dream? Why? And how exactly do you define the "Dream"? Send your story and contact information to RealStories@turner.com and you could be featured in an upcoming article on CNNMoney.